At Mornington Golf Club we take pride in making your event special, from weddings to conferences, and everything in between. Choose from one of our packages or our expert chefs can create a custom menu which will cater to your individual needs and budget. 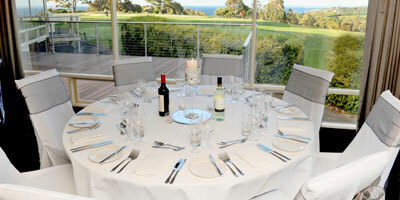 Our function venue has two rooms available, both with sweeping panoramic views of our course and Port Phillip Bay, making the perfect backdrop for any occasion. Our professional front-of-house team is ready to ensure your experience with us is an unforgettable one. Please contact our Hospitality Manager, Rhonda Vincent on (03) 5975 2784 or click here for further information or to make a time for a walk through of our facilities.